McArtha Linda Sandy-Lewis, better known as Calypso Rose (born April 27, 1940 in Bethel, Tobago) is a Tobagonian calypsonian. She began writing songs at the age of 15, and has written over 800 songs. In 1966 she wrote the song "Fire in Me Wire", which has since become a calypso anthem. Rose was the first female to win the Trinidad Road March Competition, in 1977 with her song Tempo. She won the Calypso Queen title five years running. She has also won both the Trinidad Calypso Crown and Road March competitions in 1978, the Sunshine Award in 1989 and the Trinidad and Tobago Hummingbird Medal in 2000. "The undisputed Calypso Queen of the World!" American Blues/R&B and Rock and Roll Hall of Fame artist Bonnie Raitt covered Rose's song "Wah She Go Do" on an album, released in 1973, entitled Takin' My Time. "The sharp-tongued first lady of calypso"
"In calypso - at least at carnival time - it's all about the competition, about who's got the song with sharpest lyrics and the catchiest melody to become the soundtrack of that year's bash. 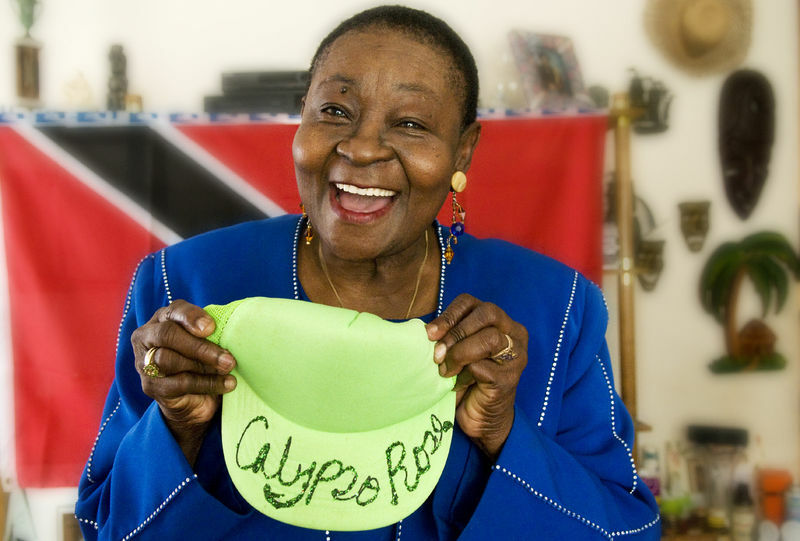 And Calypso Rose, one of the few women to sit at calypso's top table, knows success. A calypsonian since the age of 15 more than half a century ago, her trophy cabinet is distinctly overcrowded. Not only did she win the Calypso Queen title at the Trinidad & Tobago Carnival five years on the trot, she also remains the only woman to scoop the Calypso Monarch and Road March titles in the same year. With a self-penned repertoire of more than 800 songs, Calypso Rose - born of the equally splendid name McArtha Linda Sandy-Lewis - is as sharp a social commentator as any of the music's more celebrated practitioners, people like Mighty Sparrow or Roaring Lion. Welcome to the court of the calypsonian queen." "Rose was born in Bethel, Tobago. She was the fifth child of eleven children, her father being a spiritual Baptist leader. At age nine, she moved to Barataria, in Trinidad. In 1955 she composed her first Calypso after witnessing a man stealing the spectacles off of a lady’s face in the Croisée, San Juan. In the calypso she advised Tobagonians to stay at home, because Trinidad was no place for them. She first called herself “Crusoe Kid” but the late Spoiler, and tent members Piggy and Spike changed her name to “Calypso Rose – the Mother of all Flowers”. In 1963, she traveled outside of Trinidad and Tobago for the first time. She covered the islands from Grenada to St. Thomas. Little known is the fact that she won the Calypso King contest and the Roadmarch in St. Thomas singing “Cooperation”, her first recording. In 1965 she wrote “Fire In Meh Wire”, her trademark song (which is included on the double CD). The first verse was written in St. Croix, the second verse in Barbados and the final verse in Trinidad. In 1967 she recorded it on Sparrow’s National :abel and competed with it for the Calypso Crown in 1968. Although Kitchener won the Roadmarch that year with “Miss Tourist”, it was “Fire In Meh Wire” that carried revelers through the streets that year and the year after. She followed up with “Palet” and “The Bicycle” in 1968. Two years later she released “Rose Making a Baby” and “Engagement Ring”, both of which are featured in a medley on Disc 1. Rose then migrated to New York in 1974 and bounced back with the hot “Do Dem Back” in 1975 to be the runner-up behind Kitchener for the Roadmarch. She also placed third in the Calypso finals, but more importantly the song won her a Gold Record in New York. Finally in 1977 she officially won her first Roadmarch with “Tempo”. This was a significant achievement, making her the first female to win the coveted title. On a personal note, she did the double in 1978, winning both the Roadmarch with “Come Leh We Jam” and the National Monarch Title singing “Her Majesty” and “I Thank Thee”. “Her Majesty” also placed second in the Roadmarch race, a unique feat. “Come Leh We Jam” came from a dream she had while in Tortola. In her dream she saw a tall Afraican lady chanting. She then saw a blackboard with letters on it. She woke and wrote the tune without stopping.